Eating the same vegetables is certainly better than eating no vegetables. However, a lack of variety in the greens you consume doesn’t just lead to boredom but can also have negative health effects for some people. It’s common knowledge that eating a variety of foods is the key to good health and vegetables are one of the most important food groups to eat daily. Though all vegetables are important, green vegetables are one of the most nutritious food for a few different reasons. It is easy to eat the same leafy greens repeatedly, especially if you eat a lot of salads. Typically when someone finds a vegetable or salad blend they enjoy they tend to keep going back to it. This habit can lead to some unintended consequences. You limit how much nutrition you can gain from your daily servings because the nutrients aren’t diverse. Some vegetables may be harmful in large quantities depending on your health. These you have to rotate. 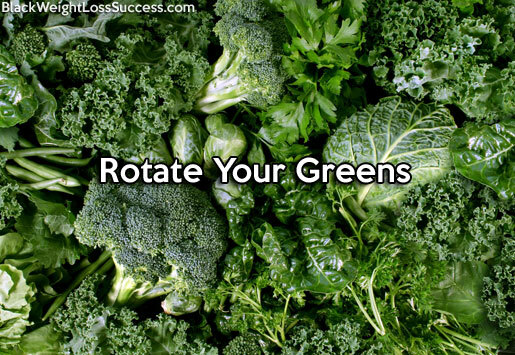 Not all greens are created equal and some varieties have more nutrients than others. For example, iceberg lettuce is common in many store-bought salad blends and is often used in salads at restaurants and fast food joints. Iceberg is mostly just water and lacks nutrition, therefore eating this vegetable isn’t going to help you much as eating a variety of greens. Instead you should eat a variety of salad lettuces higher in nutrition and mix them all up. If you don’t rotate the green veggies you eat, you could be causing your diet to become deficient in minerals or vitamins like calcium or vitamin C.
Become familiar with what nutrients and vitamins are in the green veggies you’re eating. Look them up online on sites like Fooducate and the USDA’s Nutrient Database and you’ll be able to see the nutrient composition of the green veggies you eat regularly and which ones you could add to your diet. and If you eat high-quality produce and a large variety you won’t need to take a lot of dietary supplements. Although the vegetables you find at your grocery store or farmer’s market are all safe for consumption, eating the same produce over and over or eating one type of vegetable in very large quantities can cause health problems for some people who may not be aware of the potential issue. Let’s use spinach as an example. Spinach is a very, very nutrition leafy green that is rightfully considered a superfood. It is common in salads, green smoothies and many other dishes. Have you noticed that your teeth may feel somewhat gritty or like they have a coating after eating spinach? This is because of oxalic acid. The average healthy person could eat a few handfuls of spinach a day without a problem. However, some people are more apt to developing kidney stones, a condition that eating a lot of spinach can exacerbate. Eating nothing but spinach or a large amount every day is what we are talking about. Most people would have no issue, just people with specific medical issues. The problem: Many people may not be aware that they have these medical issues. “It is now generally believed that the body can dispose of oxalic acid at even relatively high dietary quantities without trouble. Trouble arises for people who may have a genetic predisposition that impairs their bodies’ ability to process oxalic acid, so they may need to regulate their intake of it. Some studies suggest that people with a history of heavy or recent antibiotic use may be at much greater risk from dietary oxalate. Many antibiotics can kill the flora that degrades oxalate such as oxalobacter, and lactobacillus acidophilus and bifidus. Oxalobacter is a human intestinal bacteria that can reduce the urinary oxalate concentration following an oxalate load. Should we avoid eating oxalic acid? No, we just have to be aware of our own health and understand what is in the green veggies we eat so that we can get the most out of them. Just like many things in life, too much of a good thing can be a bad thing in some cases. Always eat a variety of vegetables and leafy greens. This is especially crucial for those eating a vegetarian or vegan diet. Eating a variety of green vegetables is more than just buying a different lettuce the next time you go grocery shopping (though this is a good place to start). First you need to understand the different families of vegetables. Here are the 4 main families of greens you’re going to commonly use in green smoothies and salads. When it comes to rotating your greens you don’t want to just rotate varieties within a family but also the families themselves. So, if you eat a lot of kale in your smoothies one week, try to use lettuces or spinach the next week. This also goes for salads you make or just any vegetables you use in cooking. Make a concerted effort to try a new vegetable every time you go grocery shopping.